I'm using Firefox 41.0.1 on Fedora 22. I noticed this behaviour when I was trying to open a PNG image link on a GitLab site. The server replies with "Content-Disposition:"inline; filename="logo.png" and Content-Type:"application/octet-stream". I made some tests using this tool and, apparently, when I click a link and the response headers contains the application/octet-stream mime type, Firefox offers me to open the file using gedit, stating it's the default application. If I download the file (in this case, a PNG image) and double-click on it, it opens on Eye of Gnome. xdg-open also opens it in Eye of Gnome. I have removed the ~/.mozilla/firefox/<profile>/mimeTypes.rdf file and the issue persits. I have also removed the ~/.local/share/applications/mimeapps.list file and the issue still persists. I have restarted Firefox and logged out of my Gnome profile as well. So, again, my question is: is it possible to have Firefox either display the file on the browser (if it is a file it's able of rendering), or offering the correct application able of rendering it (if there's one on the system)? Or does the server declaring the incorrect mime-type renders it all impossible? Also, why is it thinking gedit is the default octet-stream handler? Is this correct? Check for any application/octet-stream entries in those, and either comment them out or remove them. Well, seems that Firefox will not fix this issue but I fixed it in my way removing the application/octet-stream=org.gnome.gedit.desktop from my ~/.config/mimeapps.list and using the add-on OpenDownload² to provide me the Run option. If the extension of the file being downloaded is correctly configured in the mimeapps.list, firefox will open (run) it like a charm. @Bob answered part 2 of the question: how to control which app opens the file. The answer to part 1 is: Firefox downloads all files of type application/octet-stream by design. According to the HTTP standard, a compliant browser MUST NOT second-guess the server if a content-type is specified. Since octet-stream files contain arbitrary data, the browser should download them. Most browsers ignore the standard in favor of user friendliness. Firefox does not. As stated in @Geyslan's answer, you would need to use a 3rd party extension to circumvent this design choice. Not the answer you're looking for? Browse other questions tagged linux firefox fedora gnome mime-types or ask your own question. 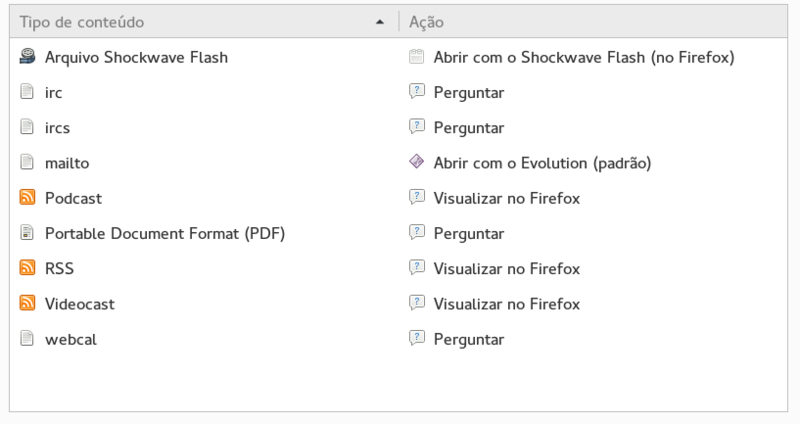 How to make Firefox file associations consistent with Ubuntu file associations? Is there a work-around for Firefox not properly handling file actions without a mime type? Linux - How to change default application for text files with custom extensions? How to force Firefox to open MP3 files with a given application? How to set “File Roller” (aka File Manager) as default for ALL supported types in Gnome and Cinnamon?